Please Note: Only 3 left in stock - order now! 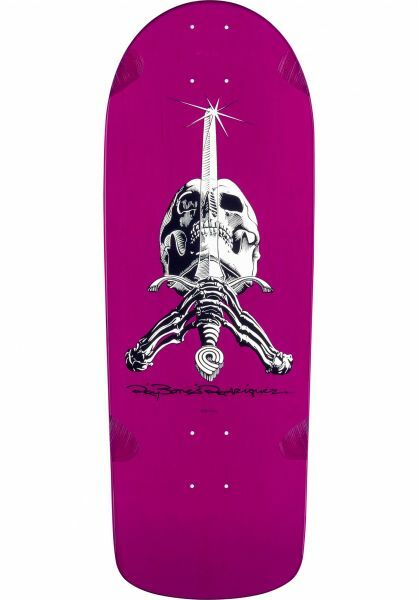 The OG Ray Rodriguez Snub Nose Skull & Sword Deck from Powell-PeraltaThis Skull & Sword graphic actually was inspired by a doodle that Ray Rodriguez drew on a matchbox when he was 12. No joke. After lots of modifications, the graphic eventually developed its way into becoming a part of skate history. 40 years later and it's still going strong! This deck is called the OB Snub Nose because that's exactly what it's got. It also has a 10 x 30 inch size, making it a real clunker. The square tail completes this bad boy perfectly. Did somebody order old-school with a side of the stuff legends are made of? Order up! Classic old school re-issue, can't believe we used to skate with such little nose. Extended wheelbase is nice though.